Good evening! Today as I was leaving work, I said good-bye to my co-worker Alex, and he said, "nice hat!" Of course I said, "THANKS I MADE IT! YOU JUST MADE MY NIGHT!" Hahaha...it was great. I was wearing the Blue Bonnet Bell, and it really did make my night. Unless, of course, he actually thought it was ugly and just burst it out, kinda like when you see someone with a really bad hair cut. Moving on... tonight I unveil the Peachy Python wrap sweater. Once upon a time, I had a beautiful peach wrap top from J.Crew. 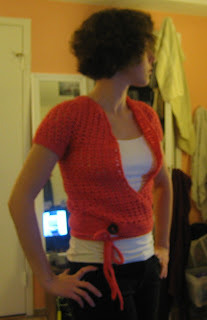 I loved it forever, but it wore out; and so I decided to make myself a new one using the pattern from Lyon Brand Yarn that I used for the Creeping Rose Vine Cardigan. You have to register to get the pattern, but it is called V-Stitch Wrap-around Sweater. I followed the pattern as normal for size small, but started increasing by adding V-stitches to the end of each row only (1 inc made). Once it reached my waist, I added two buttons, one at the end of each row. One button faces outward and shows on the outside; the other button faces inwared so you cannot see it. I made long chains after this and sc back across and around the entire outside of the sweater. It came out perfect, and I can't wait to wear it once the weather gets warmer! Sorry the pics are so blurry, but hopefully you get the idea!